River's Edge is a stylish, up to date Camden Maine cabin with a floating dock for swimming, sunning & fishing. The river is crystal clear & clean. The neighborhood is quiet, woodsy & full of nature. Half the property is woods with 500' of river front. There's a feeling of seclusion, yet other houses are nearby. You'll find great views of the water & mountains & enjoy elegant & functional antiques in fine condition. River's Edge was built in 1970 & is comfortable & relaxing. White-washed antique barn board brightens the central living area. High ceilings throughout make the cottage light & airy. It's owned by an artist & maintained by her energetic handy man. At times, River's Edge is owner occupied & is then given the careful attention & feeling of 'home' you'll find & enjoy. Amenities include bed linens, plenty of fluffy towels, telephone, toaster, microwave oven, coffee maker, lobster pot, dishes/utensils, outdoor gas BBQ grill, cable TV, DVD player, high speed WiFi Internet access for your computer. A Comfortable, Peaceful Setting: River's Edge is a retreat for the artist, writer & poet in you--a cozy vacation home on the Megunticook River with views of lovely Mount Battie. To your left, up river, is a dam that forms Lake Megunticook. About two miles down river is another dam, the Seabright, which creates this most peaceful section of river for your enjoyment. You will find it perfect for swimming, floating, kayaking, canoeing, fishing or sunning on its banks. It is a rare quiet spot without the motor boats, water skiing or jet skis you may like to enjoy on the Lake, which are accessible just around the corner. River's Edge has a floating dock, shared with a friendly neighbor, on the beautiful river & nearly 500' of shoreline. Half the property is woodsy. Ceiling & floor fans, monitor & electric heaters. Weekly maid service is provided. You may request more frequent maid service for an extra charge. Grocery provisioning in advance or mid-week. Babysitting available. Well behaved PETS are welcome. An Artist's Well-loved Cabin: River's Edge was built in 1970 as a family summer place, situated on land that was once a pasture serving the farm house which still stands across the street. Sheep grazed here, an apple orchard bloomed & a small barn stood near the road. When the cottage was built, the old barn's original wide pine siding was used inside the living room. The cottage is comfortable & relaxing. Now white-washed, the antique barn board brightens the central living area. High ceilings throughout make it light & airy. River’s Edge is owned by an artist & maintained by her energetic handy man. The home is well equipped for the comfort of up to 4 adults. You will find 2 bedrooms, one with a queen-size bed, another with a twin set. The bathroom has a tub, shower, plenty of hot water & fluffy towels. The kitchen is roomy & all set with everything you need for cooking up a storm, including a large, vintage, restored refrigerator, new gas range & oven & new microwave. There is a large gas grill just outside. Summer in Camden, Maine: There is a large color TV with cable & DVD player. Several shops in Camden rent current & classic films on DVD. The sectional sofa was added in 2006 and is all ready & comfortable for afternoon napping. Or, you could nod off on a lounge chair down on the floating dock. River's Edge is a place to be close to nature. The wildflowers have a timing and cycle all their own. Lupine are followed by Day Lilies, Queen Anne's Lace, then Daisies in many varieties, Black eyed Susans, Goldenrod, and many more which you can have fun identifying. There are wildflower reference books at the house; enjoy & use them on your walks. The wildflowers attract droves of butterflies & hummingbirds. You'll see Swallowtail & Monarch, as well as others more exotic & rare. See NOTES section under RATES for detailed cancellation policy. The bathroom is roomy & well-lit with plenty of fresh, clean, new, fluffy towels, a strong shower spray, large tub & lots of hot water. Across the river you see Mt. Battie & the craggy, green hills around it. Floating dock with swim ladder on the Megunticook River. No land line at the house. Please bring your cell phone. Reception is good. Soft sheets & blankets. Plenty of fluffy towels. Wireless DSL network live throughout & outside around the house. Vintage, with freezer, large, restored, reliable, works well. Eye-pleasing dinner, salad, luncheon, bread & butter, dessert plates & bowls galore, in fine condition. New gas stove with fan hood & large oven, toaster oven, microwave oven, coffee maker, cuisinart & blender. AM-FM Tuner on Home Stereo Speakers with iPod connection. Owner's personal library is extensive & eclectic. Walk out the living room onto an awning covered deck facing the lawn & river. Glass top round table & 4 comfortable chairs for outdoor dining, seats up to 8 cozy. Swimming, boating & fishing from dock on the crystal clear, clean Megunticook River. Shaded porch deck with patio table & chairs (seats up to 8) overlooking large lawn, river & mountains. Outdoor gas grill just outside kitchen door. Wireless DSL network (bring your computer). Cable TV, DVD player, cordless phone & answering machine, microwave, full size refrigerator & freezer, gas stove & oven. The living room is carpeted with room size & area rugs. Recently updated with comfy sectional sofa, side chair & ottoman. There's a built-in, custom made, full length, lighted bookcase, stocked with good reads. Chef services available. Grocery provisioning in advance or mid-week also available. In home massage by licensed massage therapist. Babysitting services. Boat rentals. At first, I thought the price was a bit high but when I saw the setting I immediately knew it was worth every penny. The Megunticook River has a dam at each end with a 24-hour very slow flow of fresh water. It was such a perfect temperature and we were never aware of any current. On the big Megunticook lake (which flows into this "river"), there are motor boats and a public beach that can get crowded. That water is a bit cooler too... On the river, only canoes, kayaks, paddle boards and of course, swimmers. And so few! We often had the entire water to ourselves. The dock was a lovely place to lounge. The cottage is not updated nor glamorous and has old furnishings but we had everything we needed and it was clean. Another amazing thing about this rental is that you are in a magical, serene place yet only a mere 1.5 miles to the Camden harbor! So close yet a world away. We took a 3-minute drive every day to get ice cream! The lake rentals are much farther out. I only found two vacay rentals on the Megunticook River and we are so happy it was available. It is the best place to stay in the Camden area. We would go back for sure! My husband and I have stayed at Rivers Edge for the last three years. We were delighted on our first visit to find everything exactly as described, and even better in many cases! The cottage is comfortable and thoughtfully equipped. The setting is perfect, and the best thing of all is the deck. We eat, nap, watch the loons and read there every day. Constance is a perfect hostess who keeps the cottage exactly the way she would live there. We cannot recommend it highly enough for a couple who want the Maine experience of water and nature. We hated to leave this charming cottage on Saturday. The location is perfect. The view is spectacular! We really had to force ourselves to do other things because sitting on the dock fishing or swimming was all that we really needed for a relaxing vacation. The cottage is beautifully decorated and very well equipped. Our dog loved exploring and the back yard was big enough for him to sniff safely. All in all a magical spot for a get-a-way! 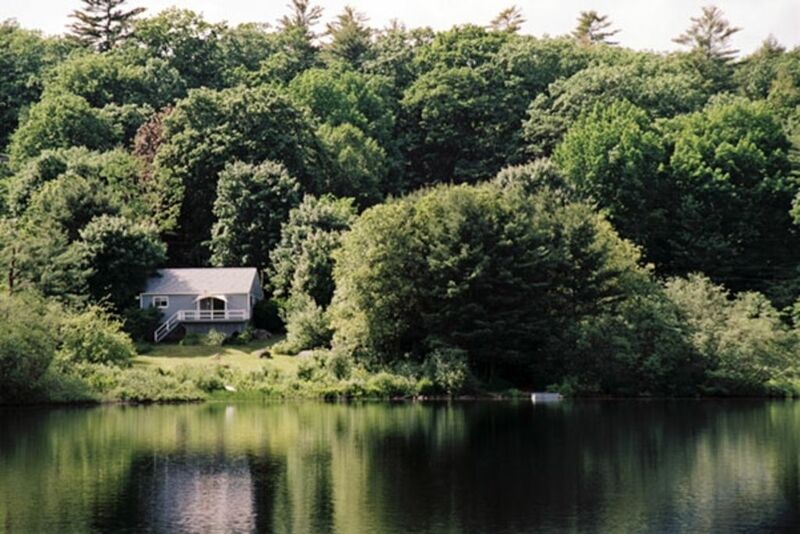 River's Edge is a charming, well appointed, small cottage which is located on a beautiful section of the Megunticook River. The lawn and foliage is very well tended and adds to the attractiveness of the property. A well stocked kitchen, containing everything one could want for cooking, and all the necessary supplies in the bathroom, as well as access to the internet and several games available for guests, enhanced the visit. Convenience to Camden, with its many restaurants, shops, and magnificent harbor is certainly a plus. Our dog was supplied with a dog bed, toys and a towel and he thoroughly enjoyed his stay, as did we! A book detailing housekeeping items, checking out, local restaurants, and places to see was also helpful. The owner was efficient and responsive from the time we contacted her about booking the property until we checked out. We would certainly recommend this cottage to others and would certainly rent it in the future. We found River's Edge to be very comfortable, well maintained and located in a very peacefull setting. It's location is ideally suited for exploring, not only Camden, Rockport and nearby communities, but also within easy driving distance of Bar Harbor, Acadia, Freeport and numerous other charming Maine towns. We enjoyed the views and hiking at Camden Hills State Park and all of the wonderfull resteraunts in the area. Be sure and stop by Red's Eats in Wiscasset, preferrably in mid-afternoon, when the line's not halfway around the block. Also enjoyed the lobsters and chowder from Graffam Bros. in Rockport and the philo and brie at Jordan Pond house in Acadia. The owner was very charming and helpful and we definitely recommend this property to anyone wanting to explore Maine's mid-costal region. River's Edge is a charming cottage, well-maintained and very clean, with beautiful views of the river and mountains. It is peaceful and relaxing, located near popular locations (Camden), and lovely small towns (Hope, Union, Lincolnville), all easily accessible. We enjoyed cooking in, as much as eating out, and often opted to just spend the day relaxing on the deck, reading, and watching the loons, deer, eagle, and chipmunk. River's Edge Cottage is located on the Megunticook River in the charming, seaside village of Camden, Maine. Classic schooners sail from town on day long & overnight trips. Camden & nearby Rockport & Rockland offer a wealth of art galleries, antique shops, restaurants, first run & art house movie theatres. Close neighbor Rockport is home to the well-known Bay Chamber Concerts where you can enjoy world class live classical performances several times each week. In Rockport you will also find the Maine Photographic Workshops, Avena Botanicals & The Center for Furniture Craftsmanship offering classes, presentations & exhibits. The Farnsworth Museum in Rockland features an impressive collection of original Wyeth paintings. Crafts fairs, art shows, auctions, festivals & special events happen all summer long. There's a major Antique Fair a short drive away in Union in August. In September, the Common Ground Fair is a prestigious showcase for Maine's organic farmers & growers. Keep an eye out of the Monarch's cocoon - it is hanging under a rock & has edges of gold. The float in the river is a favorite haven of Dragonflies & Damselflies, both long-time residents of our planet, serving as pollinators & mosquito eaters. They are your friends & will not sting or hurt you. They will come & sit on your toe or finger & let you have a good look at their beautiful iridescent colors & patterns. This is a special treat & the only way to see what they really look like. There is no known way to preserve the colors of a Dragonfly specimen. Sometimes you can glimpse a Beaver family playing along the banks & in the water in the late afternoon. Loons can be heard calling out & seen swimming by. Last summer, our Guests reported that the loons had babies. They carry them on their backs as they glide by! The cunning raccoons usually prowl around at night looking for food. The skunk looks deceptively friendly, cute & fluffy as she prances across the yard from one section of woods to the other. Also at dusk you may spy the red fox that lives around the lake & river. What a sight! You may also see the porcupines peowling for blackberries. They live in the untamed parts of the property, between the house & the dam. The songs you hear in the early summer evening are sung by the Bull Frog chorus. As summer draws to a close you'll begin seeing Canadian Geese and hear their honking as they make their way to their winter homes. You'll also see Loons, Cormorants, Osprey, Blue Heron, Egrets, Crows, Hummingbirds, Hawks, and Turkey Vultures. Pay attention to the sky and spot an Eagle soaring alone. In September, listen for the Owl in the evenings and occasionally a Woodpecker at dawn. October brings changing colors every day all around. Cool crisp air is mild enough to invite you to sit outside on the porch and enjoy the abundant nature as it prepares for winter. By November, the leaves are falling and the best of autumn in New England sets in. All cancellations by GUEST must be made in writing and received and acknowledged by OWNER or her LOCAL REPRESENTATIVE. If GUEST cancels this Rental Agreement after it has been signed by GUEST and returned to OWNER or her LOCAL REPRESENTATIVE and more than 60 days prior to CHECK IN TIME, there is a cancellation fee of 50% of the RENT which amount shall be reduced only in the event that the PROPERTY is re-rented for the RENTAL TERM. If GUEST cancels this Rental Agreement after it has been signed by GUEST and returned to OWNER or her LOCAL REPRESENTATIVE and less than 60 days prior to CHECK IN TIME, there is a cancellation fee of 100% of the RENT which amount shall be reduced only in the event that the PROPERTY is re-rented for the RENTAL TERM. For a Re-Rental for the same amount of RENT as set forth in this Rental Agreement, all amounts previously paid by GUEST shall be refunded to GUEST less a cancellation fee of 10% of the RENT. For a Re-Rental for an amount of RENT less than set forth in this Rental Agreement, all amounts previously paid by GUEST shall be refunded to GUEST less the difference between the RENT herein and the RENT for the Re-Rental and a cancellation fee of 10% of the RENT. Any refund to GUEST will not be made until after the Check Out time for the Re-Rental and all amounts for the Re-Rental have been paid. This cancellation policy is strictly adhered to and GUEST is encouraged to consider purchasing optional travel insurance that will cover GUEST in certain situations as set forth in that policy should GUEST need to cancel this Rental Agreement.